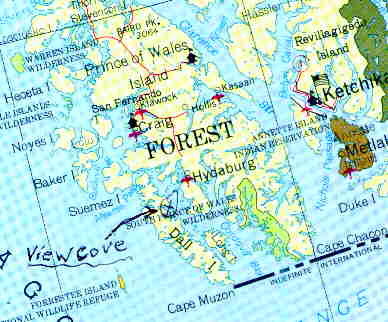 What is now the Ghost Town of View Cove on Dall Island, Alaska, located in South Eastern Alaska, about 45 miles west of Ketchikan, and about 6 miles southwest of Hydaburg, which is located on Prince of Wales Island. View Cove operated as a limestone quarry camp where crushed limestone was quarried and shipped to Seattle, WA where it was made into Portland Cement. It operated as an active quarry from about 1928 to about 1942 when it was shut down because of World War II. In more resent years View Cove has served as a Logging Camp. The quarry was in operation only during the summer months. It employed about 20 to 25 men in the summer and only two watchmen during the winter months. Most of the same men came back many years although all were only summertime jobs. The years of the 1930's were during the Great Depression days and even part time jobs were scarce. My brother and I worked at View Cove during the summers of 1937 and 1938 while we attended college during the school year. Ps.18:2 The LORD is my rock, my fortress and my deliverer; my God is my rock, in whom I take refuge. He is my shield and the horn [a] of my salvation, my stronghold. Ps.19:14 May the words of my mouth and the meditation of my heart be pleasing in your sight, O LORD, my Rock and my Redeemer. Listed here are links to pictures and stories.